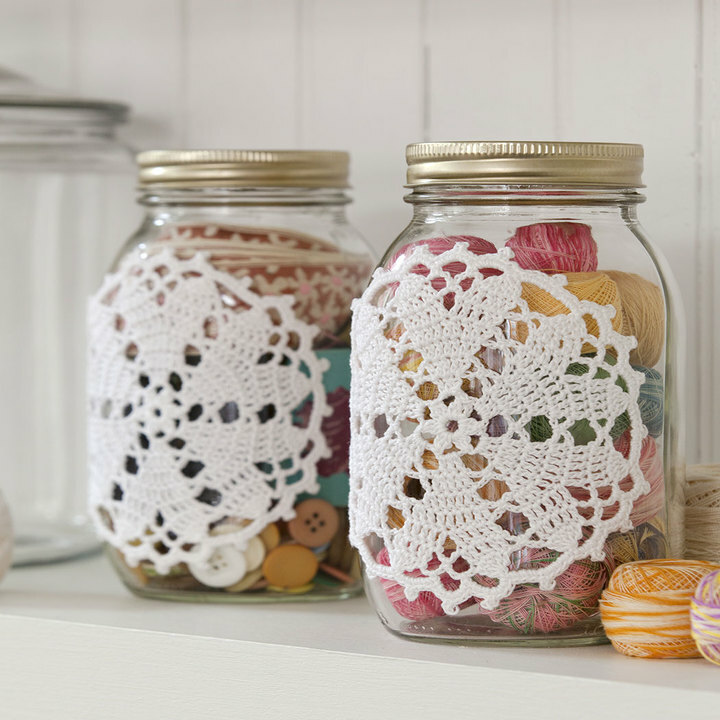 Dress up your storage jars by adding simple lace doilies, perfect for both food gifts and craft organizing. beg cl (beginning cl) = [yo and draw up a loop, yo and draw through 2 loops] twice all in ring, yo and draw through all 3 loops on hook. cl (cluster) = [yo and draw up a loop, yo and draw through 2 loops] 3 times all in ring, yo and draw through all 4 loops on hook. beg 5-dc-cl (worked over next 4 sts) = [yo and draw up a loop in next dc, yo and draw through 2 loops] 4 times, yo and draw through all 5 loops on hook. 5-dc-cl (worked over next 5 sts) = [yo and draw up a loop in next dc, yo and draw through 2 loops] 5 times, yo and draw through all 6 loops on hook. picot = ch 3, slip st in top and side loops of sc. Ch 7; join with a slip st to form a ring. Round 1: Ch 2, beg cl, ch 4, [cl, ch 4] 5 times; join with a slip st to top of beg cl. Round 2: Slip st in first 2 ch of ch-4, slip st into ch-space, ch 3, 2 dc in same space, ch 4, [3 dc in next ch-4 space, ch 4] 5 times; join to top of ch-3. Round 3: Ch 3, dc in same ch as joining, * dc in next dc, 2 dc in next dc, ch 2, sc in ch-4 space, ch 2 **, 2 dc in next dc; repeat from * around, end at **; join. Round 4: Ch 3, dc in same ch as joining, * dc in next 3 dc, 2 dc in next dc, ch 4 **, 2 dc in next dc; repeat from * around, end at **; join. Round 5: Ch 3, dc in same ch as joining, * dc in next 5 dc, 2 dc in next dc, ch 2, sc in ch-4 space, ch 2 **, 2 dc in next dc; repeat from * around, end at **; join. Round 6: Ch 3, dc in next 3 dc, * (dc, ch 4, dc) all in next dc, dc in next 4 dc, ch 4 **, dc in next 4 dc; repeat from * around, end at **; join. Round 7: Ch 3, dc in next 4 dc, * ch 4, sc in next ch-4 space, ch 4, dc in next 5 dc, ch 2, sc in next ch-4 space, ch 2 **, dc in next 5 dc; repeat from * around, end at **; join. Round 8: Ch 2, beg 5-dc-cl, * [ch 5, sc in next ch-4 loop] twice, ch 5, 5-dc-cl, ch 7 **; 5-dccl; repeat from * around, end at **; join to top of first cl. Round 9: Ch 1, (3 sc, picot, 3 sc) all in ch-5 loop, * [(3 sc, picot, 3 sc) all in next loop] twice, (4 sc, picot, 4 sc) all in next ch-7 loop **, (3 sc, picot, 3 sc) all in next ch-5 loop; repeat from * around, end at **; join to first sc. Fasten off. Weave in ends. Lay the Doily flat (Right Side down) and evenly rub with glue. Place on the center of the jar. Allow to dry completely before moving. 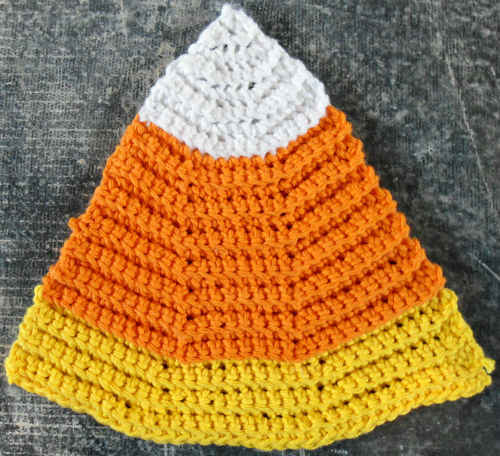 ch = chain; cl = cluster; dc = double crochet; sc = single crochet; yo = yarn over; * or ** = repeat whatever follows the * or ** as indicated; [ ] = work directions given in brackets the number of times specified.